California is the world’s eighth-largest economy, and its IT challenges exceed those of many national governments. That was particularly true during the budget crisis that began in 2008. In the face of severe budget cutbacks, state agencies needed to radically change the way they operated to keep meeting their missions to serve citizens. 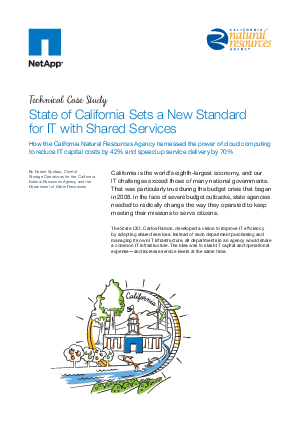 The State of California sets a new standard for IT with Shared Services. Learn how the California Natural Resources Agency harnessed the power of cloud computing to reduce IT capital costs by 42% and speed up service delivery by 70%.